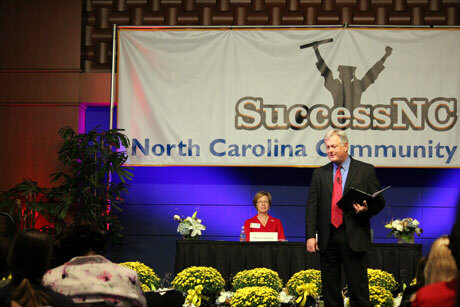 Today’s Plenary Session addressed the need for developmental education redesign in the NC Community College system. The two presenters ( Clive Belfield, Ph.D, and Michael L. Collins ) showed recent research findings that would be informing policies to support developmental education redesign in the NC Community College System. It was basically a great deal of statistics and information based around developmental education. What was great about this session, was the depth of knowledge that the presenters could bring, including statistics and lessons learned. The bad thing about this presentation was that it was based solely around developmental education. So, for anyone NOT directly related to developmental education, this was an early-morning, nearly hour-long lecture about something you could not relate your teaching to. I had never seen so many people with their faces in their phone or tablet devices. This gets to one of my biggest beefs as far as speeches go: Relating to your audience. Too many speeches are about the speech-giver or a public policy, and NOT about the people being spoken to. The most important thing when delivering a speech to a group of individuals is to give them content they can relate to. A speech about your business, or your accomplishments can do very little to help me run my business or teach my classes. If you find yourself giving a speech to a group, make sure your content relates to your audience or at the very least comes with some straight tips or suggestions in which those enjoying the speech can walk away with to improve themselves or their programs. Michael L. Collins, Jobs for the Future Associate Vice President for Post-secondary State Policy, is a policy researcher, analyst, writer, and thought leader who is assisting the NC Community College System as we develop and implement policies to increase the number of low-income and minority students who successfully transition from high school into college, persist, and earn credentials and degrees. Dr. Clive Belfield, Associate Professor of Economics at Queens College and Adjunct Professor of International and Public Affairs at Columbia University, is leading two research initiatives for the NC Community College System: a study of multiple measures of placement for entering college students, and an analysis of labor market outcomes for community college graduates. This entry was posted in Professional Development and tagged belfield, collins, community college, dockery, dr. belfield, Dr. Clive Belfield, Michael l. Collins, nc community college system, ncccs, ncccs conference, ncccs conference 2012, Plenary, plenary session, Tyler Dockery.